The spotlight is now shining brightly on wildlife tourism in Thailand and Sonya’s husband Gary is carrying the torch. Even though Sonya’s and Gary’s wedding is only days away, Gary is training hard to literally fight for this cause. Even at one of the busiest times in their lives, these two compassionate people never seem to stop giving… (read here about how Sonya and Gary donated all their wedding gifts to charity!) They are always looking for a worthy cause to help people, to help communities, to help environment or to help animals. An exciting time in Sonya’s life is approaching – her wedding! In September, Sonya will marry her partner of six years surrounded by her friends and family. During this period of planning, Sonya realised she wanted to give back, to the Friends With Dignity charity. Sonya choose a charity that supported those who were not so fortunate to be surrounded by boundless love. Friends With Dignity is a charity that supports all victims of domestic violence. Their company mantra says that domestic violence does not discriminate, so neither do they; they seek to help every victim regardless of gender, ethnicity or sexuality. It is compromised entirely of volunteers who work with a network of refuge’s to support victims who have been displaced due to domestic violence. These men, women and children have to leave their homes due to fear. Often having nothing but the clothes on their back. Here at Eco Tan Charity, our mission is to do good in the world. For the environment, for our skin, for animals and, of course, doing good for others. Sonya is a big believer of reaping what you sow, and her strong Christian faith provides the backbone of her charitable nature. Our latest charitable cause is sponsoring Samang Chen, a woman from Cambodia, through Good Return. Good Return is a not-for-profit organisation that allows people and businesses to provide microloans to those in poverty around the globe. How you got started: I started TheWellnessWarrior.com.au as a blog to chronicle my experiences while healing from cancer naturally. That was about 2.5 years ago, and since then it has grown in popularity to now become a hub for all things health and wellness. It is a virtual sanctuary where I share my story, lessons, and healing info every day. My little pug girl, my boyfriend, my family, reading brilliant books, being near the ocean, nature, raw cheesecake, preparing and eating amazing healthy food, connecting with my virtual family via my website, and so much more! I have a very eclectic taste in music – from laid back folksy stuff, hip- hop, dance, and especially old school stuff. Do you have a book you could recommend to us? I just finished reading Wild by Cheryl Strayed and it was brilliant! I’m also reading Pattie Boyd’s autobiography, Wonderful Tonight, and it’s great too. I love bios from that rock era. The Sunshine Coast. I don’t think there is anywhere better than here! Share with us a memory that makes you smile? In 2009 I trekked the Himalayas with two of my friends. It was amazing. We saw the most magical sights and met incredible people. But it was the physically hardest thing I’ve ever done, and completing the trek was the first time I realised how much inner strength I have. This was also right before I was diagnosed with cancer for the second time, so it is one of my last wild and free experiences. A little while after that I started Gerson Therapy and threw myself into my healing regime. Our lives are not determined by what happens to us, but by how we react to what happens to us, not by what life brings to us, but by the attitude we bring to life. What’s being healthy mean to you? To me, being healthy means making all lifestyle decisions from a place of pure kindness and respect for yourself. Your favourite Certified Organic product? One vitamin everyone should take? The Eco Tan team took part in the Paradise Kids Angel Appeal. This is an annual fundraiser to support more than 300 children dealing with grief, loss or illness. Last Friday, the Eco Tan team was lucky enough to be invited to mega babe and super mum, Kimberley Welman’s “Stay Strong Mummy” Detox Your Pantry Workshop. 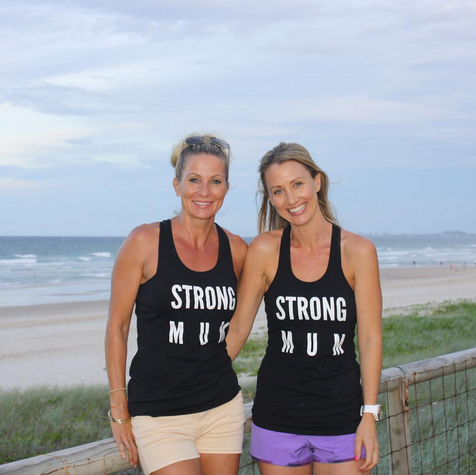 The amazing Certified Holistic Health Coach and Personal Trainer, Vicky Reihana, and Instagram wholefoods blogger, Amanda, joined Stay Strong Mummy (Kimberley) in hosting an intimate gathering for like-minded mums. Stay Strong Mummy (Kimberley) is a strong and empowering woman, much like Eco Tan’s founder, Sonya, who has created our brand’s ethos to be based on striving for health, passion and integrity. These ladies continue to teach us that a wholesome healthy life translates to inner joy personally and that extends to others. The theme of the Stay Strong Mummy event was learning about wholefoods for the whole family. Busy mothers, Kimberley, Vicky and Amanda, shared their personal stories of how they came to see the health benefits of “trading up” every day pantry staples with heavenly whole food alternatives. As the women spoke, we (the audience) held onto every word while sipping organic wine and easting delicious wholesome treats! The mummy’s were inspiring yet relatable women, all successful in their own way. Balancing a crazy household and children, while teaching them vital lessons on the importance of health and wellbeing. We wanted to share our top five takeaway lessons from the night with our Eco Tan family. Although these women are at different stages of their whole foods journey, Kimberley, Vicky and Amanda now know to nourish and fuel their bodies. Eating on a regular basis, a balance of natural and unprocessed foods is the key! Stay Strong Mummy said, “I now eat more than ever before and feel the best I have since pregnancy”. These women made it clear that they did not believe in punishing their bodies with crazy diets that restricted food intake. Be wary – don’t let the package fool you! We need to be super careful when we scan labels for nutritional facts. The “organic” or “gluten free” label on food fools many people. But what people fail to see is that this does not necessarily mean the food is healthy. Vicky pointed out that sugar can easily be disguised in the foods we eat under one of it’s different 257 names! It’s scary how many foods contain preservatives and processed ingredients. We would never eat these ingredients by themselves, so we shouldn’t be okay with eating them when they’re hidden in common foods. Vicky recommends avoiding big lists of ingredients with things that we can’t understand. She says “if we don’t know what it is, our body doesn’t know what to do with it”. The key is being organised! These super mums say the key to eating healthy is buying healthy. If you have wholesome foods in your pantry, you will cook with wholesome foods! Amanda said her kids like to be involved in their weekly food preparation (sometimes!). Also, in her family, they dedicate Sunday afternoons to preparing and cooking several meals for the week ahead. 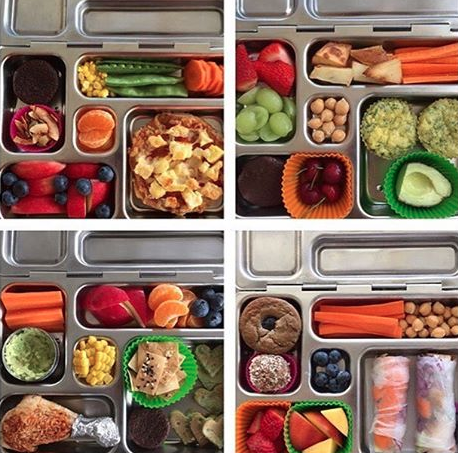 Some highlights of Amanda’s delicious and wholesome kids lunchbox creations. This is a lot easier than you think! Amanda showed us five different ways she cuts up carrots to make them appear more exciting to her children. “My kids actually enjoy having the responsibility to choose what snacks or vegetables they want in their lunch box! They also tell me how they would like them prepared and they even help to make it!” She also shared some of the insightful ways in which she manages to sneak more vegetables into her children’s meals, such as in savoury muffins and frittatas. Before you leave, make sure you’re packed with your health, fitness and travelling beauty essentials. You can download body weight workouts to your devices, pack a workout DVD or even bring along a skipping rope. I always pack my Coconut Body Milk to hydrate my skin from the stresses of traveling. This Tuesday, some of our very lucky staff members got to spend the day “working” on the set of the Firefighters Calendar Australia shoot for next years calendar! Starting the day bright and early we had to make our way to Mount Nathan to meet some firefighters for the Firefighters Calendar Australia shoot… We thought we reached our destination! Oops! We ended up in someone’s house before realising that we were in the wrong spot! Eco Community: What is a life without helping others? We LOVE to ‘give back’! We regularly sponsor animal refuses… And we even paid for surgery for homeless dogs! Sonya is also passionate about sponsoring a Romanian woman and children, a cause close to her heart. Furthermore, Sonya even donated her wedding gifts to a local domestic violence charity – read more about that here. Since its conception, Eco Tan has always been out in the community, helping other small businesses grow in the same way. Sonya’s core beliefs has driver her to always be happy to offer FREE mentoring advice to other businesses. Thus, the ‘Eco Community Mentoring’ program was born… Through Sonya’s natural passion for giving back and sharing her blessings with others.